A stunning 24 Carat Gold Presentation Disc to complement any room. 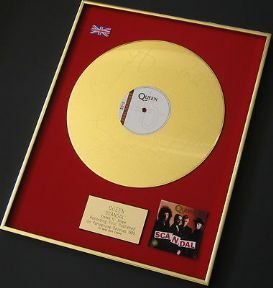 A 24 Carat Gold Coated Presentation Disc using the genuine Vinyl. Mounted on a Red loop nylon backing with an engraved polished gold bevelled edged plaque. Framed in a Polished Gold Aluminium frame.